T-R PHOTO BY ADAM RING • Colo-NESCO’s Angela Brinkman crosses the finish line during the 400-meter hurdles at the Iowa Star Conference Co-ed track and field meet Thursday at Meskwaki Settlement. Brinkman won in 1 minute, 11.25 seconds, to claim her fourth conference title in the event. 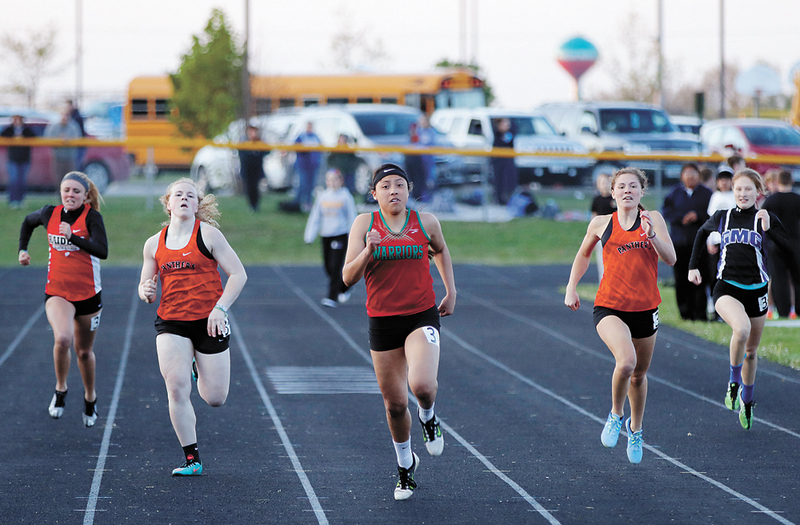 MESKWAKI SETTLEMENT — The Royals thought they were disqualified in the distance medley relay. Turns out they were winners. 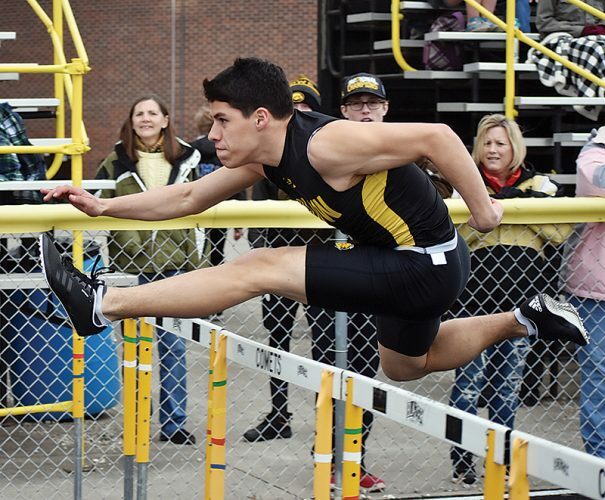 A confusion as to which team had stepped out of the exchange flipped in favor of the Colo-NESCO boys’ track and field team at Thursday’s Iowa Star Co-ed Conference track meet. The extra 10 points in the team standings helped the Royals jump by Don Bosco for a second-place finish. The Royal boys won three events to finish with 113 points. Dunkerton won the team title, and Don Bosco was third with 112. The Colo-NESCO girls won a pair of hurdle events to help them to a third-place team finish with 93 points. Tripoli ran away with the girls’ title, scoring 160 points, and Clarksville finished second with 112. Of area teams, the GMG girls (76 points) placed fifth, Meskwaki Settlement (40) was eighth and North Tama (14.50) finished 11th. The GMG boys (45) finished eighth, North Tama (30) came in 10th and Meskwaki (8) was 11th. The Royal DMR of Wayne Beard, Garrett Packer, Garret Tiarks and Caleb Cobbs won in a time of 3 minutes, 53.77 seconds, the only team to finished under four minutes. T-R PHOTO BY ADAM RING • Colo-NESCO’s Caleb Cobbs runs ahead of Don Bosco’s Zach Nie in the 3,200-meter race at the Iowa Star Conference track and field meet Thursday at Meskwaki Settlement. Cobbs won the race in 10 minutes, 11.19 seconds, setting a conference record in the process. “There was nobody behind for a second lap,” Cobbs said of anchoring the DMR. “I go to my team and they’re like, ‘We got disqualified.’ I’m like, ‘What?’ Finding out we didn’t get DQ’ed was awesome. Three times now we’ve won DMR. Beard won the 100 dash in 11.26, besting Don Bosco’s Caleb Rigdon (11.27) by a fingernail. Earlier in the day, Dunkerton’s Jordan Yessak jumped out to a commanding lead in the 3,200-meter run, but not so far ahead that he wasn’t within the sights of Cobbs. Cobbs kept his pace, kicking it into high gear on the final lap, passing Yessak and finishing in 10:11.19, 2.94 seconds ahead of Yessak. Yessak got the better of Cobbs in the 800, finishing 1.86 ahead of Cobbs’ 2:10.70. Cobbs’ hamstring started to tighten up on him in the 1,600 run, but he still found a way to finish third in 5:03.08, while his teammate Sean Cutler (5:08.59) finished fourth. Grace Tahahwah had a banner day for the Meskwaki girls. 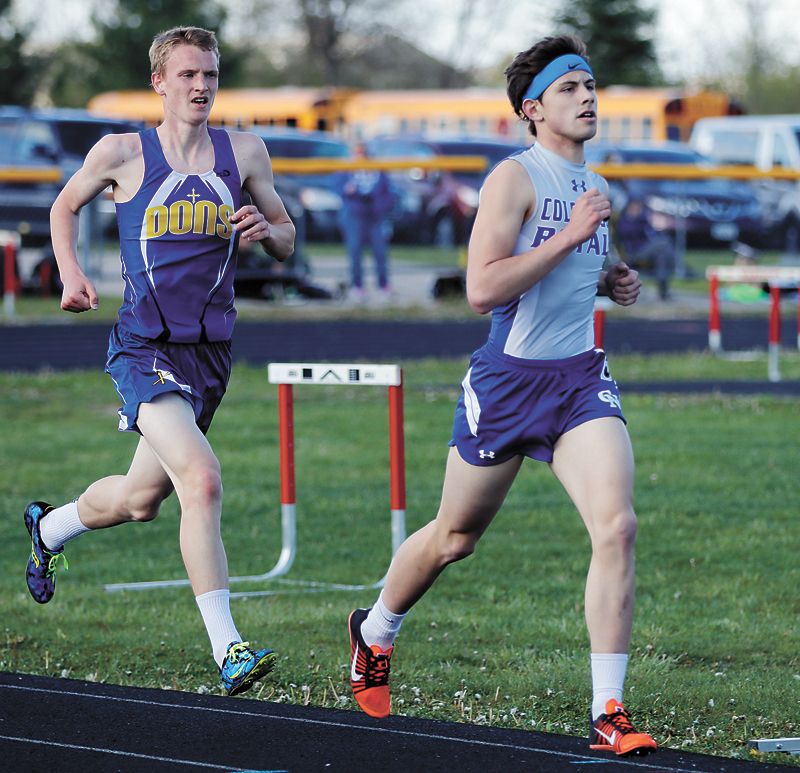 The senior Warrior fought off nerves to win the 100 and 200, setting personal-bests in both events. Tahahwah crossed the finish line in 12.64, the only runner to finish under 13. She was also the only runner to finish under 27 in the 200, winning in 26.53 ahead of a pair of Tripoli girls. “Actually, I feel really good, knowing I finally got down to 12s. That’s always been a goal of mine,” Tahahwah said. “Knowing last year I did the same thing. Just felt a little nervous, and kind of felt pressure on me. Came out and did my best. 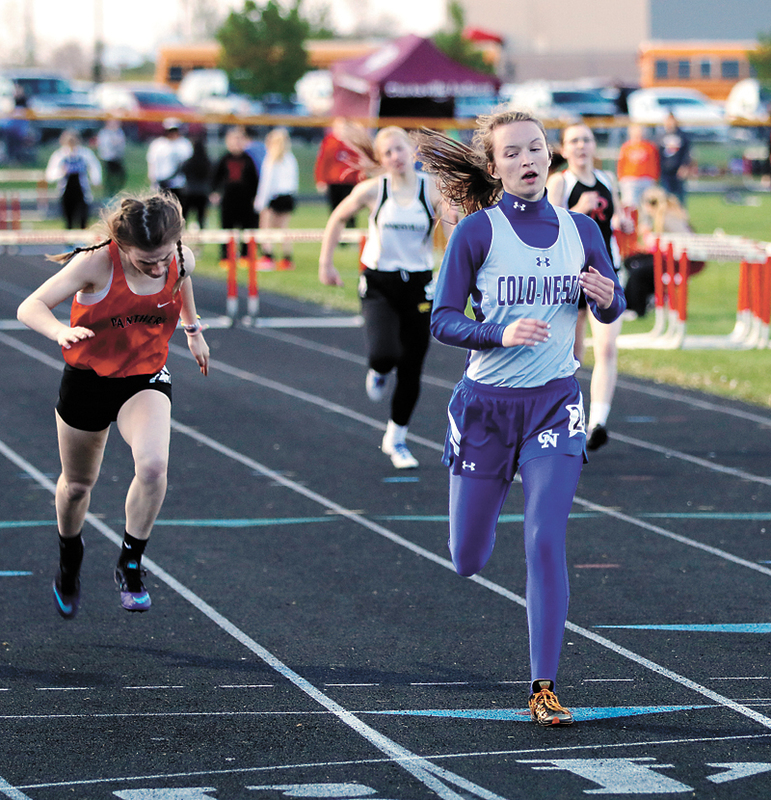 The Colo-NESCO girls left the competition in the dust in the shuttle hurdle relay for the second year in a row. The relay of Hallie Riese, Lindsey Riese, Grace Stalzer and Angela Brinkman finished in 1:12.41, finishing 4.85 seconds ahead of Tripoli’s relay. Brinkman then won the 400 hurdles conference title for the fourth time in her career, jumping her last hurdle and getting across the finish line in 1:11.25. Clarksville’s Kori Wedeking was too much for GMG’s Kyla Wilkening in the long-distance runs. Wilkening hung with her through the first couple laps of the 1,500 and 3,000 runs, but Wedeking ultimately pulled away in both races. Wedeking finished the 1,500 in 5:19.22 while Wilkening crossed in six minutes flat. In the 3,000, Wedeking won in 11:18.95 while Wilkening finished in 11:45.10. “It wasn’t the best. Starting to get sick, and been fighting shin splints the whole season. So, it’s been a little bit of an issue,” Wilkening said. “The goals of today were to get the number on my sticker and just run. Not think about anything else, just run. Girls Standings — 1. Tripoli 160, 2. Clarksville 112, 3. Colo-NESCO 93, 4. Janesville 83, 5. GMG 76, 6. Dunkerton 55, 7. Riceville 47, 8. Meskwaki Settlement 40, 9. Valley Lutheran 29, 10. Don Bosco 19.50, 11. North Tama 14.50, 12. CAL 10. Boys Standings — 1. Dunkerton 125, 2. Colo-NESCO 113, 3. Don Bosco 112, 4. Tripoli 104, 5. CAL 59, 6. Clarksville 53, 7. Riceville 47, 8. GMG 45, 9. Janesville 38, 10. North Tama 30, 11. Meskwaki Settlement 8, 12. 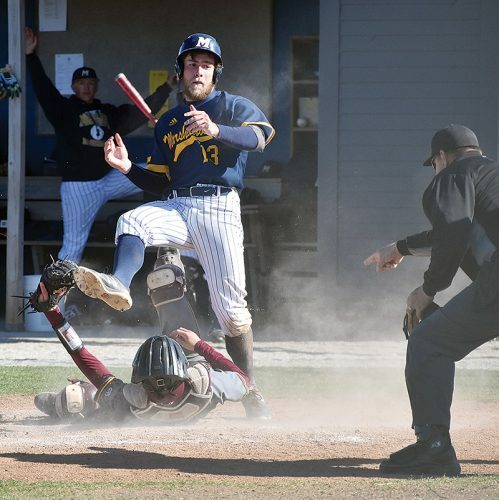 Valley Lutheran 7.